The first turbine at Gallatin was installed in 1975 and the most recent turbine was added in 2000. Over the years, the insulation on the four Westinghouse units had become old and worn. Exposed to extreme heat for many years, the pads deteriorated and released dust and ceramic wool into the air, creating a safety hazard for employees. The situation came to a head when TVA employees, who were performing routine maintenance and calibrating the turbines, reported they had problems breathing. Upon discovering the root cause of this safety hazard, the TVA turned to Local 86 for their expertise to resolve this problem. 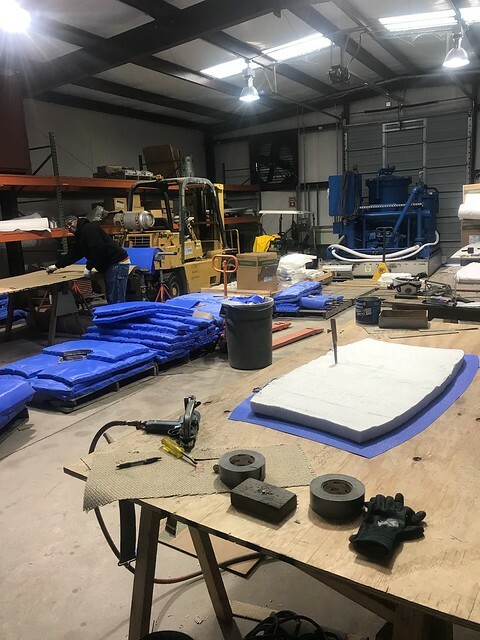 When performing their due diligence prior to the start of the project, Local 86 Training Coordinator Shane Hammock learned about the client’s needs and discussed different materials and types of pads that could be used, including the benefits of creating removable jacketing. Hammock provided TVA with suggestions based on what would best fit their needs, while providing a better encapsulation material for the removable jacketing. A closer inspection by Local 86 members revealed the old pads were piecemealed together over the life of the turbines and some of them broke down quicker because the pads were not made of the same materials. It became clear the TVA needed high-quality pads to withstand continued use in an extreme environment. The solution to the problem was custom made pads. The hot side of the first layer of pads was made with IEP Super Hot Stop with a 3,000-degree melting point and an 1,800-degree continuous run temperature rating. The hot side was filled with 2-inch super wool and a silica-based filling with a 2,100-degree continuous use rating. The cold side of the first layer was made with AMI aluminized glass cloth with a 1,000-degree continued use rating. The second layer of pads was made with the same 2-inch super wool and was covered with Alpha fiberglass impregnated in silicone rubber cloth with a 500-degree continuous use rating. All the pads for the first and second layers were made with hog ring stitching. Local 86 created more than 1,200 pads for the four Westinghouse turbines. The job employed three to five Insulators regularly for over a year, including Brother Chris Mullens, the foreman at the TVA Gallatin Combustion Turbine Plant job. Each of the four units required more than 800-manhours to create and install roughly 300 pads. All of the Westinghouse turbines were the same shape and measurement and Insulators created a pattern from the first pad and replicated those patterns for turbines two through four. During the installation of the last few pads on turbine number four, the highly-skilled tradesmen noticed the expansion joint deteriorated to the point that it needed to be replaced. Since turbines vibrate and move, a level of adjustment is required at each end of the turbine to account for its regular shifting. With this high level of attention to detail, the expansion joints were reviewed, evaluated and determined they needed to be replaced. Due to the high-quality work and craftsmanship provided by Local 86 members, all the joint replacement and expansion materials are now being completed by quality union workers. Work on this project needed to be completed both on the jobsite and in a fabrication shop to maximize efficiency and minimize the amount of time each turbine was shutdown. The true value added to this project extended not only through the more than 1,200 pads created and installed, but also through the details and attention paid to each piece by the highly skilled members of Local 86.